Sgnl technology provides an amazing opportunity to transmit signal sup to the end of people fingers using vibration. 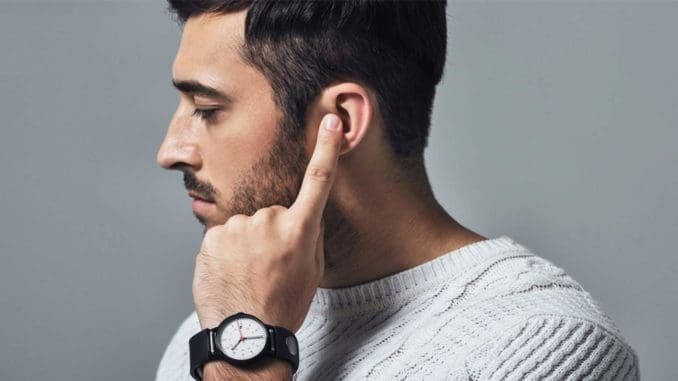 You need only to connect the strap to your smartphone and you will easily communicate even in conditions of strong ambient noise, just by applying finger to your ear. Mean while, Sgnl performs the regular duties of a traditional watch band. It is expected that the novelty will be available for sale in October this year, and its price will be around $314. For those who pre-order, the price for Sgnl band will be on $70 cheaper. After launching their project on Kickstarter, the Innomdle Lab employees have done an impressive amount of work, creating and experiencing several varieties of Sgnl bracelets. Long-time testing allowed developing the ultimate model. The final version of the Sgnl bracelet got the current shape. People can adjust the strap depending on the width of their wrist as it is done with standard watch bracelets. This month developers run beta testing with potential buyer involvement, which will be the last stage of testing before Sgnl mass production. The use of physical principles of vibrations allowed the idea’s authors to create a unique product. Now you can either stop looking for a quiet place for talking on your smartphone or getting it out of the pocket. The Sgnl bracelet transmits a vibration signal of an incoming call, after which you can press your finger to the ear and start talking. Sgnl provides the same level of hearing as if you talk in person. In addition, there is no any external headset, the communication takes place in a tete-a-tete mode. A passer-by will never hear your conversation. For example, external noises produced by a large company leave minimal impact on the connection quality. The bracelet’s body is resistible for a high level of moisture and dust. You can even put it under a stream of tap water. The miniature battery’s capacity makes the device work for a week in the standby mode and up to 4 hours of continuous conversation. The battery charging takes only an hour. Sgnl is compatible with Android and iOS operating systems (version 4.4 and 8 respectively), and the signal is transmitted via Bluetooth. An accelerometer is included in the model package. Versatility is an important advantage of Sgnl. Together with the advanced technical features implemented in the device, it can be used as a standard strap to an ordinary watch or so-called «smart watches». Besides, the locking system allows changing one watch to the other quickly and comfortably. For those disliking wearing watches, the developer offers a special prop that came with the bracelet, which can be put instead of the dial. You can control Sgnl using a special app installed on the buyer’ssmartphone. You can download it in Apple and Googlestores. • shows the incoming calls or SMS notifications. In total, the bracelet will be available in the market in six color options. Only CES 2017exhibition’s visitors could leave their comments on the model. They note that the strap has an attractive appearance, wraps the wrist comfortably and demonstrates the sound quality equal to traditional mobile phone communication. The convenience and reliability of locking mechanism,water and, dustresistance can also be noted. Of course, you could hardly listen to the music via the device, but it is not intended for this. In general, we can say that the bracelet is the first representative of a new direction of wearable devices, designed to simplify the use of the smartphone. In the future, we will present the full review of the product after the bracelet will be available for sale. Meantime, we can provide only the information obtained through a variety of presentations with the participation of the Sgnl bracelet.